While the movement to close the gender gap has seen progress over the past several decades, in some industries women remain underrepresented. 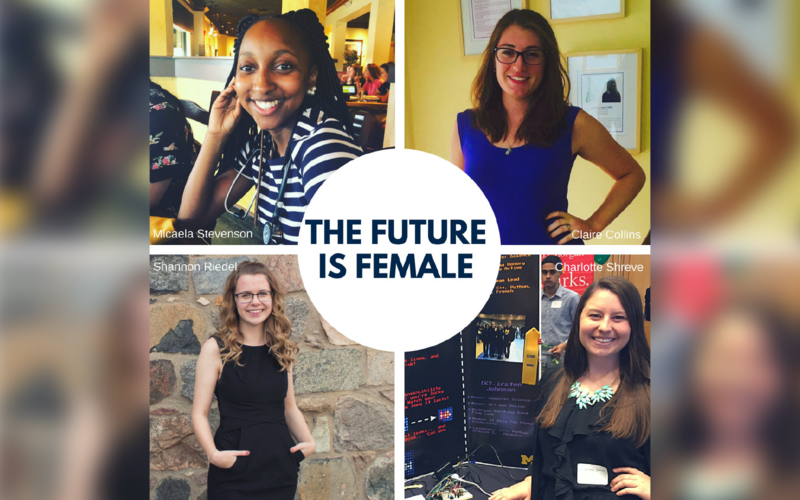 Undeterred, undaunted and unflinching, four women from the University of Michigan — recent alumna and current students — led a discussion at the Ann Arbor Library this month on how they have managed their early careers in male-dominated sectors. They discussed what led them to their industries, the challenges they face as women and advice they have for women at the start of their careers. “Not many people realize that graphic design, or design in general, is a male-dominated field. Statistically, women are awarded a higher percentage of the degrees in art, design and communication, yet men get a majority of the jobs in these fields. It’s concerning to look at these statistics and realize that my gender puts me in a disadvantaged position despite the qualifications I have. “I’ve learned that I have the opportunity to empower myself and other women in this community by demanding appropriate and equal pay, confronting gendered policies and treatment and providing resources and support to other women in the field. “Communication is essential to work toward equality in the workplace. Communicate with both male and female coworkers about their salaries, even if it’s discouraged. Communicate with supervisors and coworkers about discriminatory policies, actions and language. A 2009 A List Apart poll, created by and for web designers, indicated nearly 83 percent of web designers are male, yet a third believed there was “definitely not” a gender bias in the design field. A List Apart is a publication that explores the design, development and meaning of web content, with a special focus on web standards and best practices. “In all of medicine, a good amount of our leadership across specialties is still composed primarily of men. Men make ultimate decisions about who gets hired, who gets tenure and how practices run. Men also make decisions about access to medical care and treatment practices. Even though women might be in the field, it feels like we’re allowed to come. We just aren’t allowed to make many decisions when we get to the table. “I often feel like people are skeptical of my commitment to medicine because I am a woman and may want to also have a family in the future. I also feel as though I have to work much harder to prove my intelligence and commitment to medicine because I am a woman and I am also black. “One of the best ways I have been able to overcome barriers is to seek community with other black women and other women of color who are underrepresented in my fields. As a black woman, or anyone who experiences multiple types of oppression, I have learned multiple skills. These include everything from code-switching and working longer, harder and smarter than my white and/or male peers to prove that I am adequate to people in charge. “However, this is a lonely existence, especially when there are few people to turn to who have similar experiences. I have been fortunate enough to have a community with women of color who are willing to support me. “For other women who are looking to pursue careers in male-dominated areas, I would tell them to make sure they are following their passion. Male-dominated fields are not easy and they are often not friendly to women. If it isn’t your passion, it isn’t worth it. A 2017 report from The Greenlining Institute and the Artemis Medical Society found that women of color are severely underrepresented among U.S. physicians and face serious barriers to entering medicine and succeeding in the field. Women of color represent less than 12 percent of M.D. physicians, despite making up nearly 20 percent of the U.S. population. “Certain specialties in medicine are still male-dominated. However about half of my medical school colleagues are women. I see a decline in the percentage of women in higher positions in each department, such as deans of medical schools. “Thankfully, I haven’t faced too many challenges yet as a woman in the medical field. I continue to prepare myself for a future of challenges though, as I know that I will have to fight harder for my salary, fight harder to move up in my field and constantly toe the line of the right amount of assertiveness. “So far, my experience in the medical community is that I need to be confident, and assertive. Most male colleagues have been taught from a young age that being assertive and aggressive will be rewarded, whereas I, like many women, have grown up in a society that values women’s agreeableness and ability to please others. I have some amazing women role models, including my sister and mother, who have shown me how to advocate for myself and those I care for. “I would tell other women that they should follow their passion. Going into medicine for me was not about trying to even the playing field for myself and other women, but more about my passion. I know my passion and unique experiences and perspectives will help change the face of medicine for the better. Claire Collins, second-year medical student at the University of Michigan Medical School. Being a doctor is hard. A recent study published by the Journal of the American Medical Association indicates it can be even harder for women. Female medical residents and physicians endure bias and a larger burden with home duties. They also face a greater risk of depression. “Growing up I wanted to be everything from an archaeologist to a French teacher, but I was never into computers or video games or anything that could have predicted that I would end up in IT. “In high school, I did well in my more computational classes like math and physics but thought that meant that I should be an engineer. I had convinced myself I would never make a good engineer because I didn’t know anything about cars, so I never pursued it. “When I got to college I took nearly all non-computational classes and really struggled before I realized that being good at math and science did not mean that I had to be an engineer. I was trying to find classes that were more like the classes I excelled in before and I ended up with a killer semester that included an intro programming course and Calculus III. “It only took a few weeks of that intro programming class for me to fall in love with coding, and the rest is history. “Every challenge I’ve faced has been complex and different and certainly not always because I am a woman. The challenges I’ve faced have been as small as stressing about what to wear to work so that I would blend in with my coworkers and as big as sexual harassment, but most lie somewhere in between. “Those are problems, however, that men face as well, and thinking about the struggles I’ve faced as exclusively women’s problems is not helpful to anyone. Workplaces and educational communities can, in my opinion, never solve the challenges that women face if we’re not thinking about women’s issues as everybody’s issues. “If you’re interested in an industry that is heavily dominated by men, I say go for it. You are entirely capable of handling everything that lies in front of you. Your unique voice in the conversation is not only wanted, but needed. “When we’ve finally convinced you to join us in these industries, get involved. The thing that has helped me most when the going gets rough is having an incredible support system. The best mentors, who have gotten me through the toughest problems I’ve faced, have been the most unexpected. In the U.S., women are vastly outnumbered by men in technology fields. According to Girls Who Code, a nonprofit that aims to support and increase the number of women in computer science, women hold only 24 percent of computer science jobs, down from 37 percent in 1995, and occupy roughly 11 percent of executive positions in Silicon Valley.